Back in May we launched an online survey which ran for 6 weeks. The survey asked users about what devices, web browsers and assistive technology they use to access GOV.UK. We got 712 completed surveys back, all of whom are from people using some form of assistive technology. We'd like to thank everyone who took part. 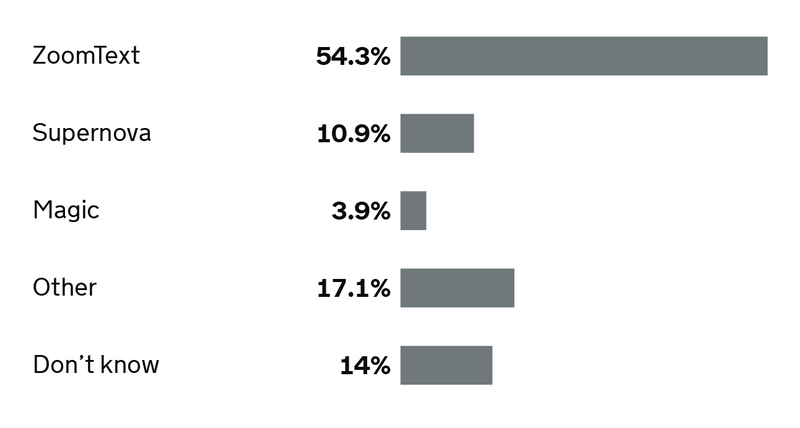 30% of users told us that they use a screen magnifier. 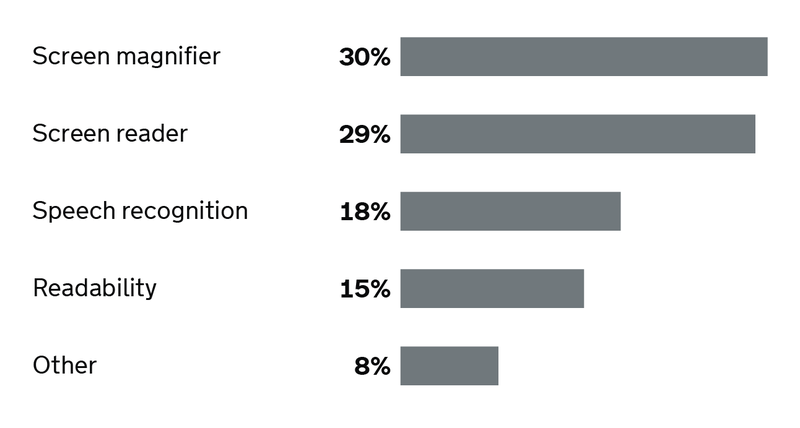 38% of those magnifiers have screen reader capabilities. ZoomText is the most commonly used in both categories. 29% of assistive technology users are accessing GOV.UK with a screen reader. 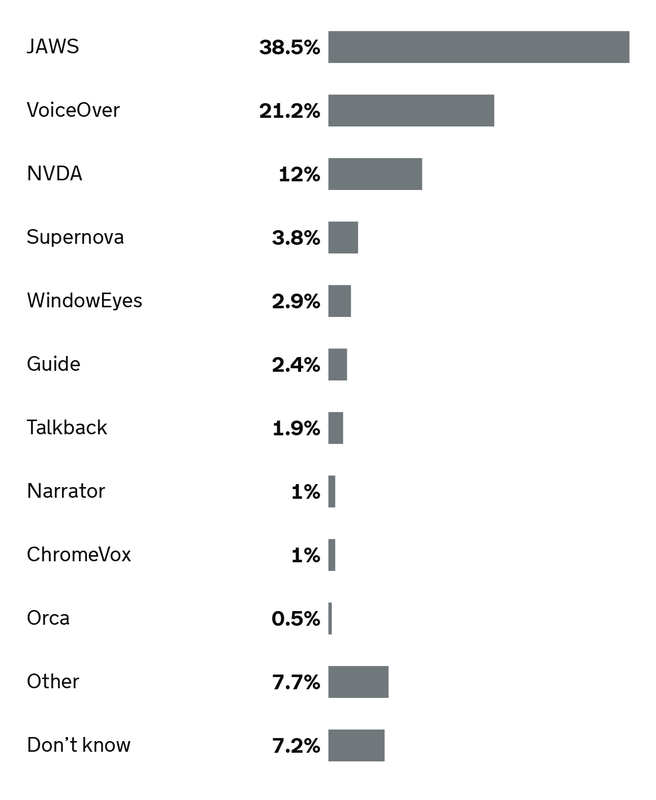 The most commonly used is JAWS, followed by VoiceOver (72% of which is on iOS). 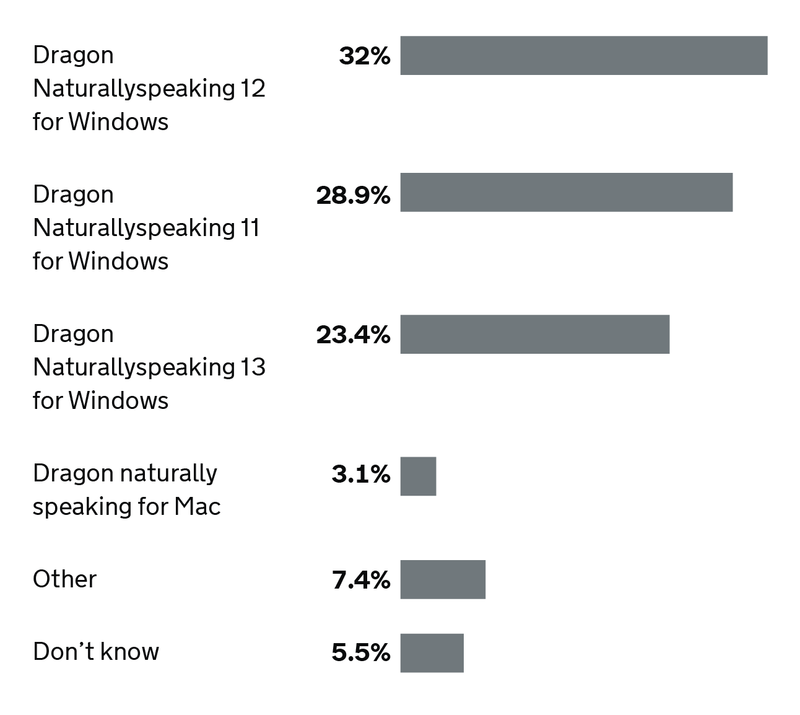 Dragon Naturallyspeaking for Windows has the highest usage in this category. The majority of users are still running version 12. This does not take advantage of ARIA support, which was not introduced until version 13. The most commonly used in this category is Read and Write. This product is aimed at users who have dyslexia. So it came as no surprise to learn that a number of Read and Write users also had Dragon Naturallyspeaking running in tandem. 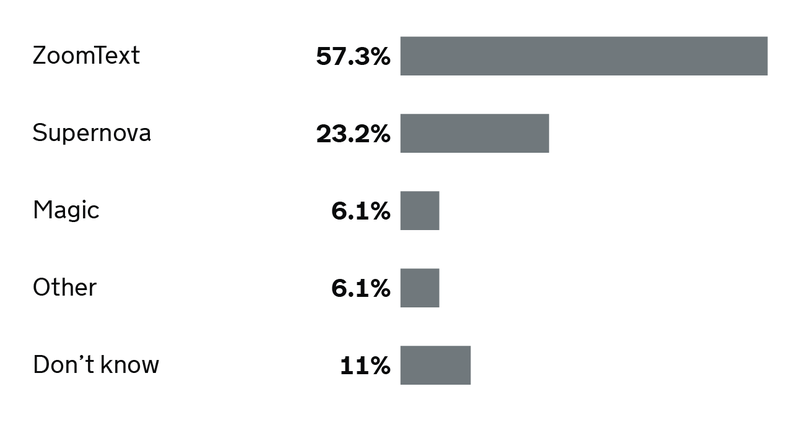 Generally Google Chrome appears to be the dominant web browser. For more information see the Technology at GDS blog post: Gaining understanding of the browsers people use. However, amongst assistive technology users Google’s web browser isn’t quite so popular. A significant number of users told us that overall they are happy with the level of accessibility on GOV.UK. Some respondents even gave it high praise due to the clean and simple design. However, some users said they found the black text on a white background difficult to read. Other users reported usability issues with start now pages, as the things you need to know before you start appear after the 'Start Now’ button, which can be missed by screen reader and screen magnification users. Several users reported that the search results page is too complicated, as there are too many options to navigate. Users felt that the interface should be cleaner to easily find the search results with perhaps an option to display advanced features for those who need more granularity when filtering. We also learnt that many assistive technology users found PDFs hard to use and asked for content to be in HTML instead. We are using the survey results to help us decide which assistive technologies we will use to test GOV.UK. We will also use the results to help us decide which assistive technologies we will advise other departments to test with. We have started a series of workshops looking at how to address accessibility issues with PDFs. We plan to carry out more user research to further investigate accessibility issues. We are also planning future blog posts to share more information about assistive technologies and the responses to this survey. Very insightful. Thanks! We're trying to work out what browser/screen reader combinations to test on at my company, so this data is super useful! In the general blind population the free screen reader NVDA is probably more common, especially in Australia, where it is developed. In rich countries, where government employees etc. have assistave tech. 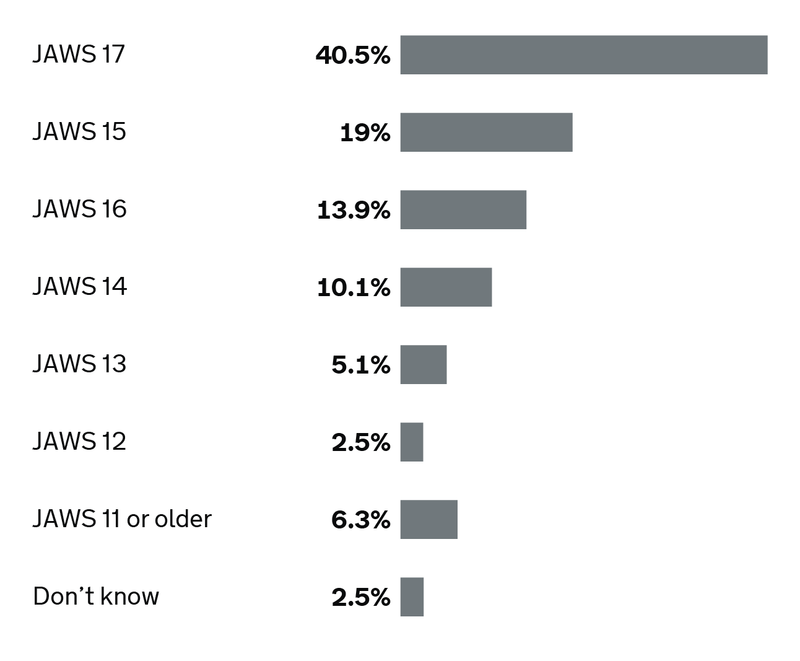 provided for themJaws is more common.I guess that NVDA and Firefox are the combination that many home users choose. This is, by its nature, a small, restricted sample. I've developed the HTML/CSS/JS framework that is going to be use on the next version of nsw.gov.au (New South Wales - Australia). I wasn't sure which screen reader to use to test the framework. Now, thanks to this article, I have peace of mind knowing that I choosed the right one, JAWS. Thanks for sharing this information!. It would be interesting to know more about the respondents. For example the use of Jaws and ZoomText, both very expensive, might indicate the users are coming from a corporate perspective. Otherwise great to have another study available. Great study thanks folks incredibly helpful - as with previous comment if you have any data about respondents be great to get a break down. It amazes me how poorly Chrome behaves with NVDA and JAWS. Whenever I perform screen reader tests for my UI dev work, I use NVDA + Firefox, and JAWS + IE11.